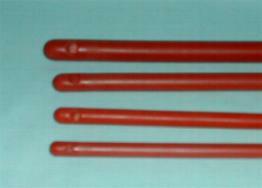 Rubber catheter with lateral eye and rounded end. Length 38cm. Available in sizes, FG44 (15mm diameter), FG36 (12mm), FG30 (10mm) and FG26 (8.5mm). Will fit and may be used with enema sets and enema syringes.